While I’m cognizant of the fact that war usually isn’t as simple as black-and-white, or good-vs.-evil, I still couldn’t muster any sympathy for Ricelt and the fate he succumbs to. 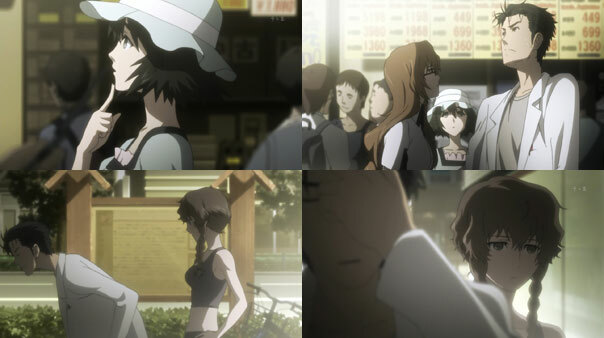 And that made it hard to get emotionally invested in this episode at all. 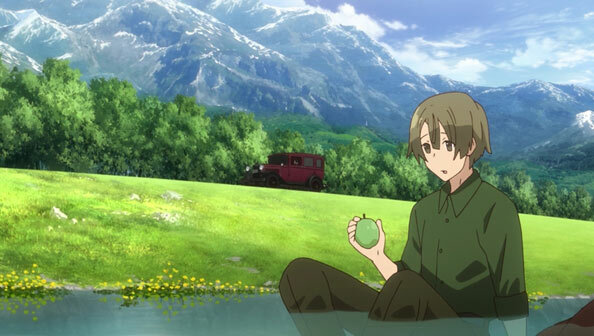 Forgetting the fact that he just happens to fall in a river just as Fine’s maid Lotte and Bianca are driving past…you know what, I can’t forget (or forgive) a coincidence of that magnitude, and I won’t. Even in tiny Eylstadt, it’s ridiculous and extremely incredible that Ricelt would end up so close to these two, let alone that they’d so easily buy his half-assed cover story. Ricelt is only able to get as far as he does thanks (in part) to Bianca’s stupidity. 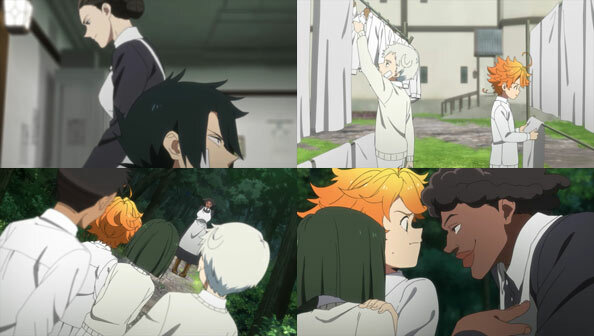 This is war; any and all strangers who suddenly show up must be suspected, not flirted with. 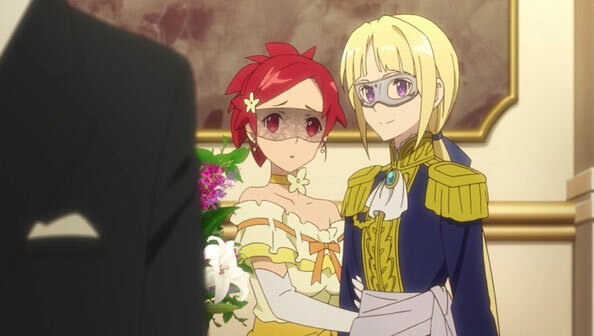 Speaking of flirting, the show’s fascination with Fine and Izetta as some kind of quasi-yuri couple continues, with Fine dressing up as a dashing prince and Izetta serving as her girly date at Lord Redford’s lavish birthday party. 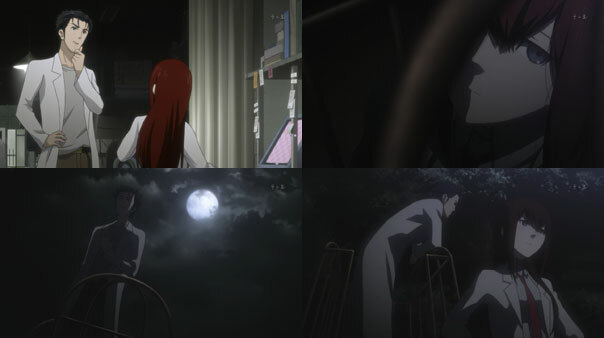 There, Berkman manages to not only meet up close with Fine and Izetta, but his “date”, who looks drugged and/or genetically manipulated in some way, even manages to draw near enough to Izetta to kiss her, drawing blood in the process (blood Berkman will surely use for research on how to neutralize Izetta). 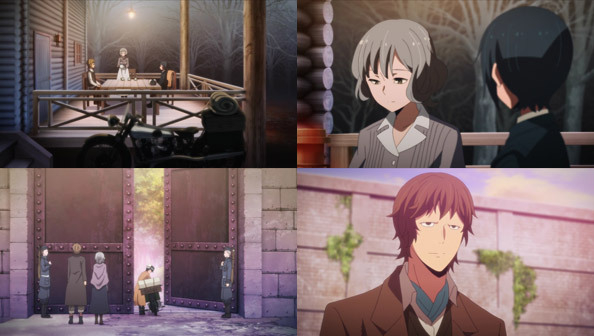 That intel and security is so inadequate and lax that one of the German empire’s most dangerous men can get so close to Izetta, and vanish just as quickly, doesn’t bode well for the future of Eylstadt. 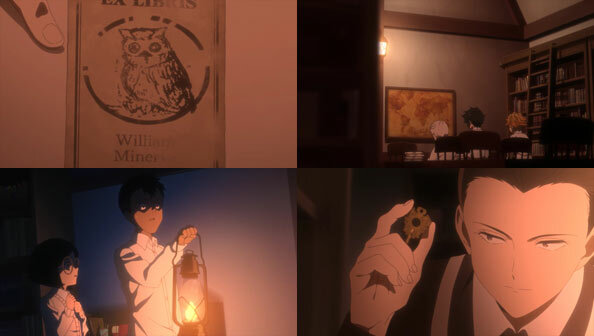 As for Ricelt, he and an inside man manage to make it to the basement of Eylstadt castle, snap pictures of the ley line map, and retrieve some kind of magical stone…but Bianca finally gets wise and Ricelt is caught red-handed. He stalls for time to let his colleague get away; Bianca shoots him, and another royal guard shoots the colleague. And so, like Jonas, another young character I thought would have a greater role to play ends up dead, though the trouble he whipped up remains. Bianca, for her part, seems shaken up about the betrayal, but it’s not like they were lovers or anything; she’ll surely get over it. As for that trouble, it would seem some random old man ends up with the camera containing photos of the ley line map, as well as the purple-pink stone. 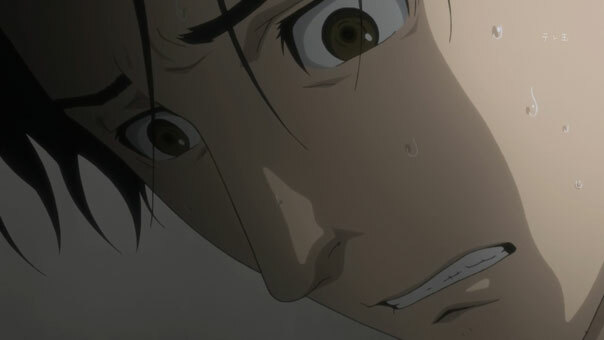 Yet again, someone is in just the right position at the right time to propel the plot forward…and I care even less about this old guy than I cared about Ricelt. Keeping the pressure high is the fact the Atlantan (i.e. 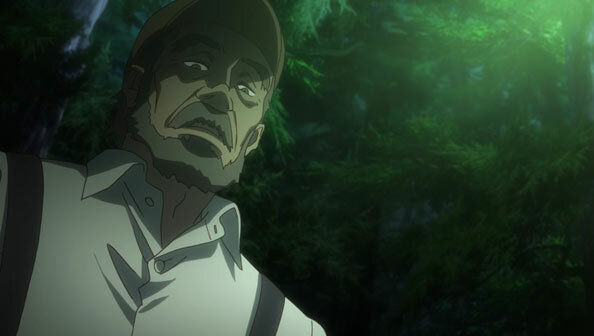 American) ambassador promises Fine and Izetta that he’ll recommend his government send troops, but doesn’t tell them that he considers Izetta to be nearly as great a threat to Atlanta as the Germanians, if not a greater threat. As such, those troops will be sent to take down both Germania and Eylstadt; not exactly what Fine wanted. 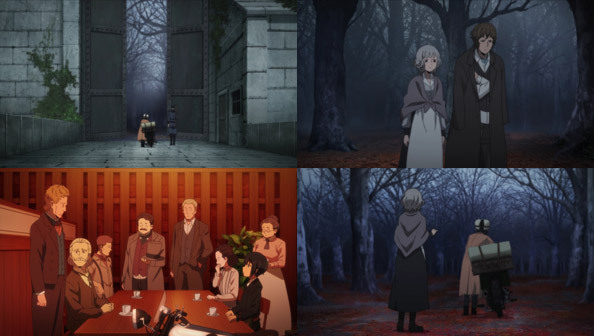 While most of Izetta and Fine’s scenes this week are kept pretty lightweight, the episode also demonstrates how precarious Eylstadt’s situation remains despite the early success of the White Witch’s unveiling. 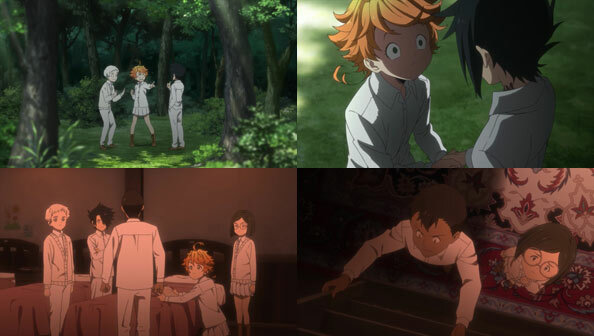 It also shows the lengths to which the enemy will go to learn of Izetta’s weakness, and the lengths to which Sieg will will go to stop them. 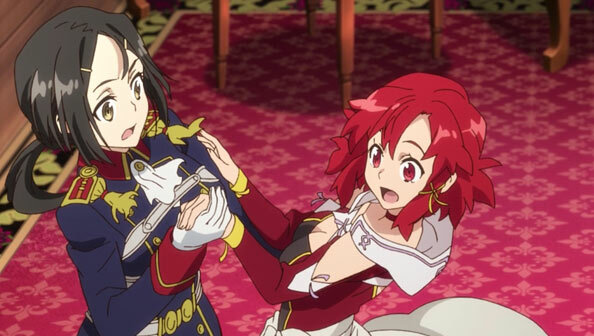 As Berkman gains access to the Empire’s ultra-top-secret “Division 9” research “workshop”, Elvira attempts to stuff Izetta in a tight corset, then makes her practice dancing with Bianca. 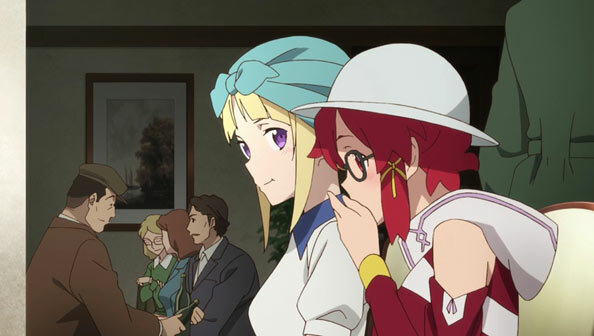 Finally, Fine and Izetta “disguise” themselves as townfolk in order to sample some desserts from a cafe Fine used to sneak off to before she was Archduchess. Suffice it to say, this is extremely reckless behavior during a time of war, even if their disguises were any good (they were not). 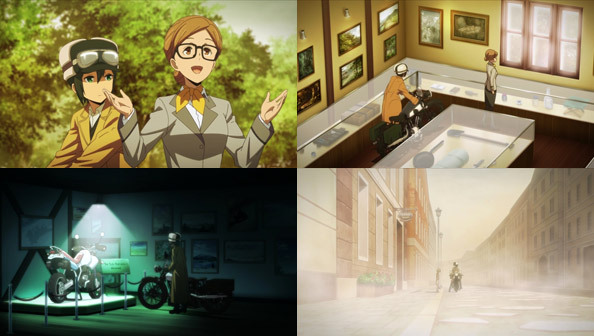 The episode tries to have Fine pass off their exposure as a good thing, furthering her popular tomboy image and such, but I wasn’t buying it; this whole detour to the bakery was nothing but problematic. It’s Sieg who serves as audience surrogate when he says gently but firmly, “no more” to Fine regarding sneaking off into town. She’s not a precocious tomboy anymore, but the leader of a country that still hangs by a thread. 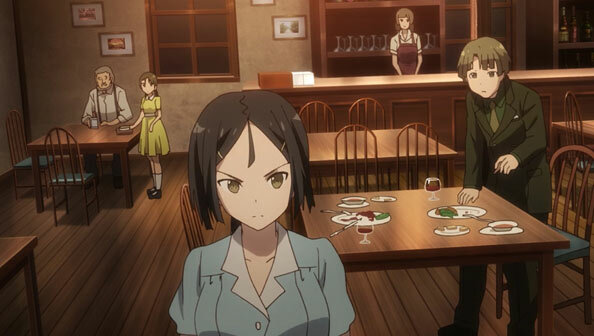 One of the frays in that thread is swiftly dealt with thanks to Sieg and his crack counter-espionage team. That means the death of Jonas and an uncertain fate for the Germanian spy who didn’t gain any information. I enjoyed Jonas as an everyman on the front lines to this point, but unless Sieg was as ineffective at protecting Fine’s interests as Bianca was this week, Jonas’ death warrent was signed the moment the spy knew he knew something. 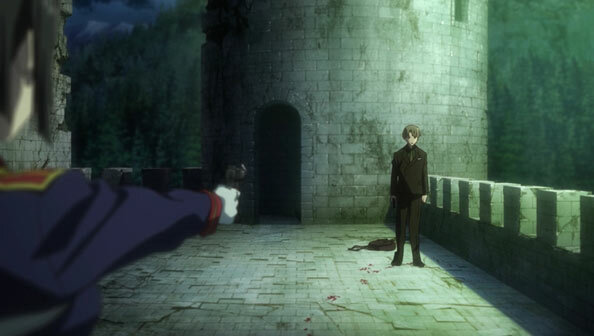 With one problem taken care of relatively easily, Sieg leaves it to Fine and Izetta, travelling by flying gun on a circuitous route, to persuade the powers meeting in Britannia to do something about the Germanians, preferably before they unveil a secret weapon of their own from Division 9. 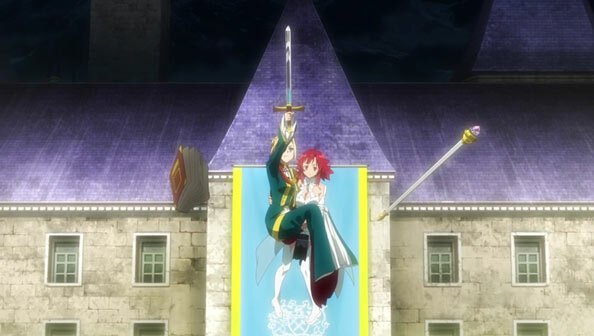 Fine’s coronation is also the stage chosen to unveil Izetta to the world, and it’s fun to witness medieval ritual juxtaposed with flashing still and movie cameras of the modern era, just as it’s fun to watch Izetta take care of business, wiping out the modern might of the Germanians with magically enhanced medieval weapons. 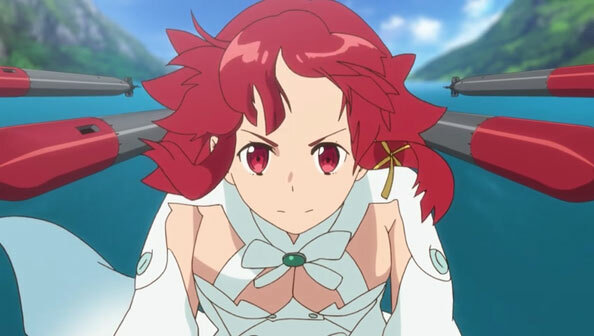 The first stage in Eylstadt’s strategy to, well, survive, is to make the world know and believe who and what Izetta is. But neither the Germanian king nor Major Berkman doubt whether she’s real. 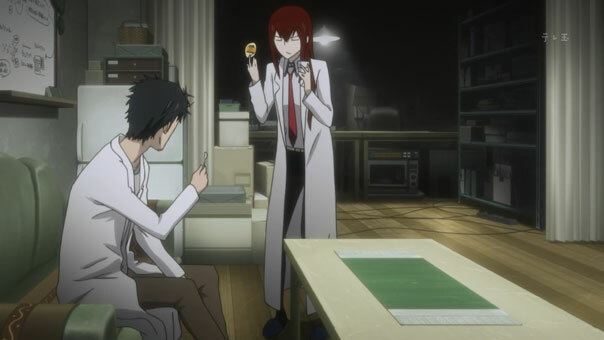 The king wants her, badly, while Berkman wants to cut Eylstadt’s propaganda off at the knees by identifying and exploiting Izetta’s still-unknown-to-the-enemy weakness. 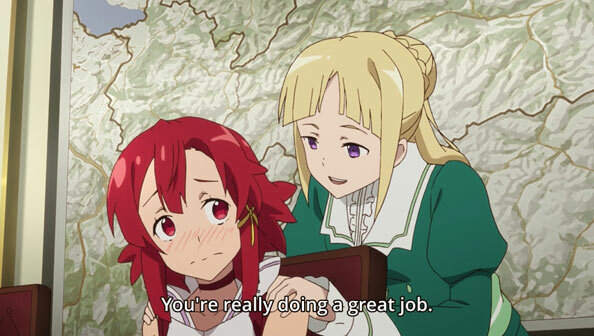 While fun, the merging of eras is also jarring, just as it’s jarring to see Izetta unleash hell against the Germanian army in front of cameras, then return to the palace to be praised like a good girl who finished her chores. 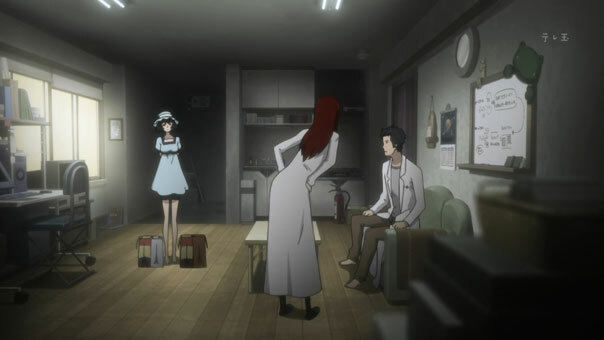 It’s a lot for Izetta to handle, but she has promised to serve ad protect Fine with her dying breath; she’s not the kind to back down just because things are tough…or weird. More than anything, Izetta is a witch who has been used dwelling in the shadows and edges of the world. Now she’s the exact opposite: a global celebrity with a fairy tale story so compelling that the people want to believe. Not only does Eylstadt want them to believe, they need them to do so, in hopes of gaining powerful allies against Germania. 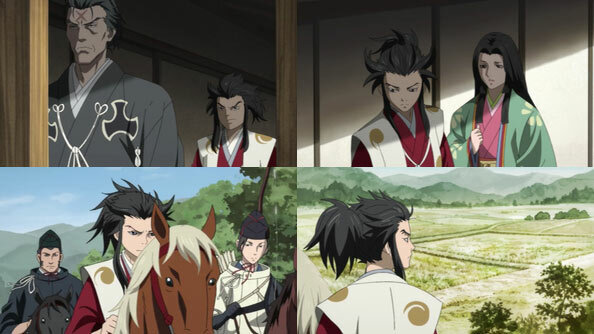 If this is to be merely a 12-episode show, I’m pleased with the generous pacing so far. 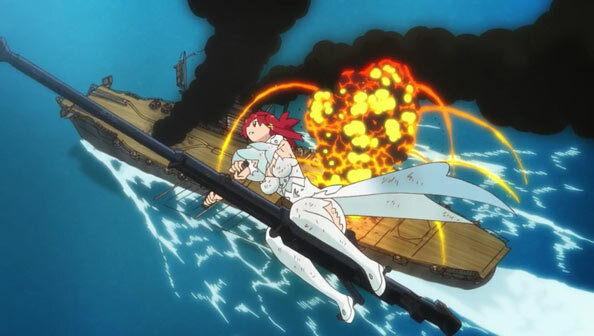 Not only is Izetta unveiled and placed into immediate use in order to quickly build up her public persona as a magical force of resistance against a no-longer invincible-looking enemy, but the enemy strikes back just as fast, advancing on the Veile Pass – a place with no Ley Lines for Izetta to draw from. The Germanian King’s adviser Eliot is sure to remind his majesty that the reason they’re invading Eylstadt is to gain supply routes between them and Romulus (i.e. Italy), not merely to capture a witch. This pass is part of that route. As it happens, Private Jonas is assigned to its defense, which won’t include bombings due to a.) the thick fog and b.) the fact the pass is worthless without intact roads to use. 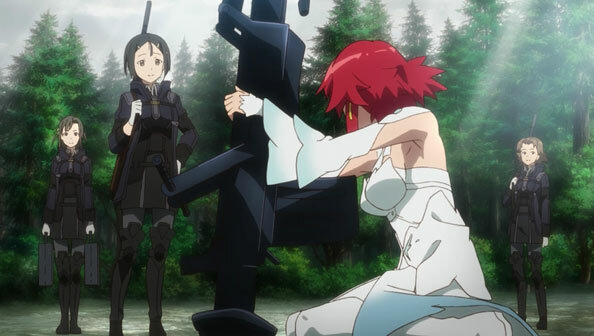 Sieg Reich and Fine’s royal guards (who are all or mostly female special forces) draw up an intricate plan that serves to hide Izetta’s inability to use magic, by drawing upon stagecraft and showmanship in a battlefield setting. 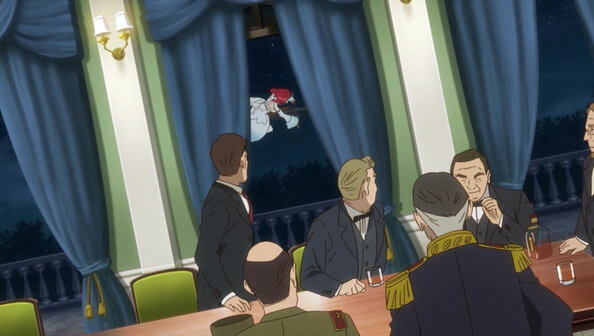 A dummy Izetta is flown behind a plane, lands on a ridge, and is replace by the real Izetta (refusing to let them use a body double), who must talk a big talk before planted bombs are detonated, taking out the advancing enemy. It works far better than it should have, thanks to an abundance of luck in both weather and geography. 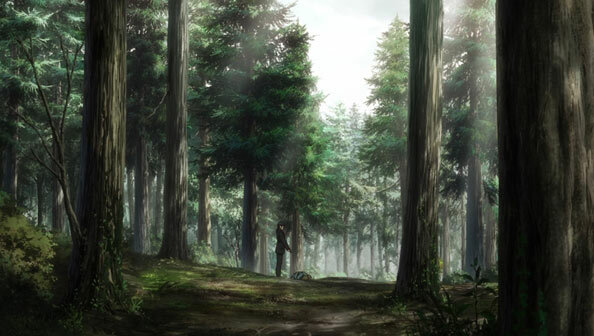 But conditions won’t be so favorable in every Ley Line-less area the Germanians target, so even though Berkman hasn’t found Izetta’s weakness yet, doesn’t mean he won’t eventually. It may happen far sooner than Eylstadt thinks, thanks to some bad luck: Berkman has a spy posing as an Eylstadt officer who happens to be in the same outfit as Jonas. 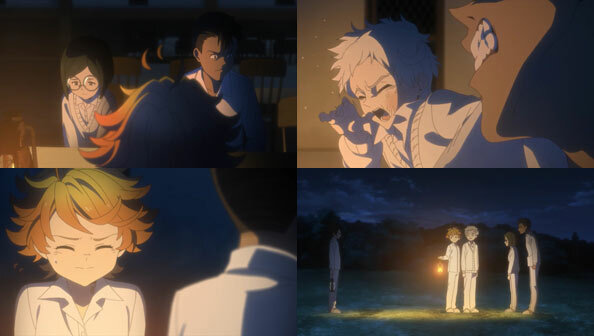 There’s every indication either he or Jonas overheard Schneider talking very loudly about Izetta’s weakness by a creek. 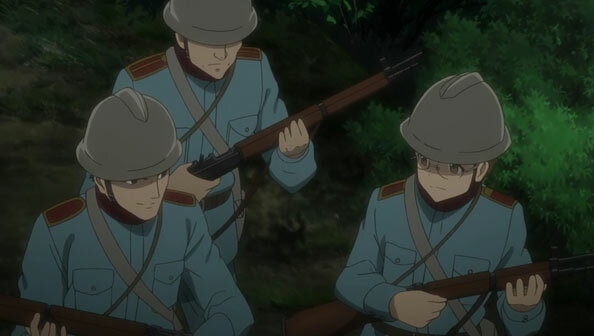 That’s the kind of carelessness that can lose a war, and I’m not optimistic Izetta won’t be re-captured by Berkman at some point. 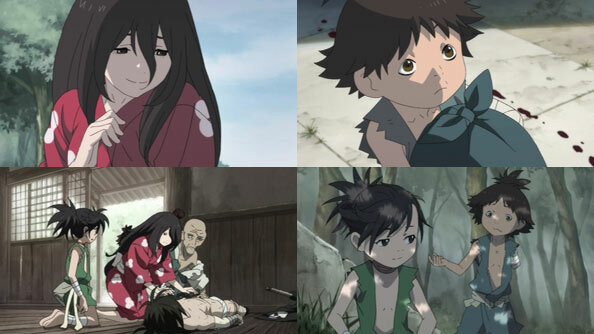 Momo, Touri, Hana and Hachiko arrive to rescue Tenchi from the science club. 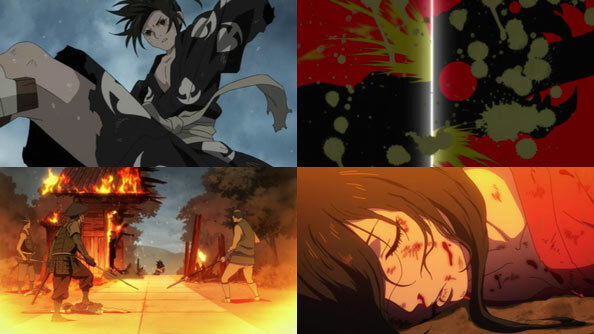 As Hachiko battles Kinojou, Momo frees Tenchi, who saves her from falling rocks as the caves start to collapse. Everyone makes it back to the surface safe and sound. That’s more like it: a short, sweet, daring, action-packed rescue mission, made possible by the tracking device in Tenchi’s Gentleman’s Area, presumably put their by Touri. 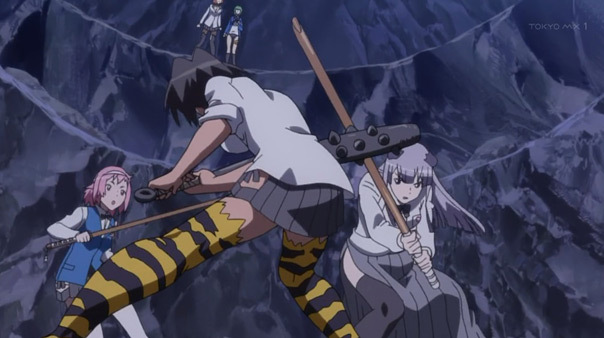 Momo and the StuCo prevail, ending up with Tenchi, who shows he can be heroic in a pinch, but we’re sure the tug-of-war (with him as the rope) has only just begun. Oh, and the dress code at this school is appallingly loose!